2012 has been one of my slowest reading years, but interestingly, it has also been one of my best in terms of the quality of books (by my yardstick). I guess when you have reduced time to read, you are probably "wiser" or choosier in deciding what to read. Also, you tend to be more willing to give up on a book, if it isn't working for you. I stopped counting the number of DNFs last year, because unlike in previous years, I was quick to put down a book, even 5 or 10 pages in. As a result, it was very hard to come up with a list of favorites. I eventually managed to whittle down my list to five books I really want you to read - four favorites and one special mention! Into Thin Air by Jon Krakauer: I haven't reviewed this one yet, but I promise to do it soon! This real-life narrative about a tragedy that unfolded on the peak of Mt. Everest intrigued, shocked, frightened and educated me so much that I still think about its "characters" and their families two weeks later. What the Zhang Boys Know by Clifford Garstang: I'm not usually one to enjoy short story collections, but this one had me spellbounded and unbored (which I totally invented) all the way to the end. The Unlikely Pilgrimage of Harold Fry by Rachel Joyce: I have already seen this book on a few favorites list and I can't help but concur. Harold's journey was enchanting, exhilarating and occasionally symbolic of his own life - Rachel's voice went well with the pacing of the story. The Singer's Gun by Emily St. John Mandel: I didn't review this one and possibly may never. The actual details of the brilliance of this book have slowly escaped my mind and there is no way I can clearly articulate the cleverness of the plot, the beauty of Mandel's writing and the gradual way the book grew on me. Make it Stay by Joan Frank: This is a book I rated five stars soon after reading it but forgot all about it until I read my own review. Usually when that happens, I tend to lower the rating of the book. But in this case, along with my recollection of the plot, I remembered everything that I loved about this book (well-etched characters, nice buildup to the peak of the story, lovely writing). I still feel the same way about Make it Stay as I did when I read it, but the details of the book probably won't stay with me. You will never go wrong with Jon Krakauer. I love Into the Wild and trust this is just as good! Happy 2013! Yikes, I haven't read any of those books. I do own Harold Fry and hopefully will get it read this year. I only recently heard of Krakauer's Into the Wild and after being wowed by Into Thin Air (similar titles! ), I am going to check his other works. I hope you get to try Harold Fry! I know it's been hyped a lot already but it really was splendid! Great list. I agree about Make it Stay - a wonderful book that I also rated highly. 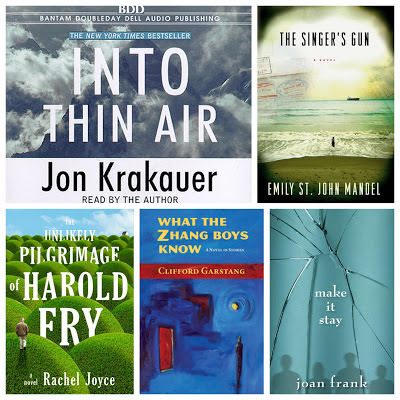 And I really loved The Singer's Gun (read it in 2011) as well as Harold Fry (which made my list of best books in 2012). I still remember Into Thin Air although I read it when it was first released which was a long time ago now! Jon Krakauer is one of those writers who never seems to disappoint me. What a great set of books. I really like reflecting at the end of the year because I get reminded of the books I loved! I actually haven't read any of these, but your list has many books on it that are on my shelves, or that I want to own. After seeing your list, I just ordered Harold Fry and Into the Wild on audio from my library. Nice job with this list. You've made me book hungry which hasn't happened in a long time!! I read Into Thin Air years ago but remember loving it. I really want to read Make it Stay after reading Frank's book on writing. I had the same reaction to Into Thin Air. It haunted me for weeks when I read it. I will definitely read the Unlikely Pilgrimage of Harold Fry. I have to read more of Krakauer's works. I had vaguely heard about his Into the Wild, but it sounds like it will be my next choice to try. I love reflecting on the year that went by. I was surprised by some of the books I read - felt as if I read them a long ago. I cannot wait to read Into the Wild as well. It sounds to be just as fabulous as Into Thin Air was. I remember coming across her book on writing, but I haven't read it yet. I'm sure it is wonderful - I will have to read it. "Haunted" is the right word! I just cannot get some of the images out of my head. The book was as vivid as watching a well-made movie would have been. The litter on the mountain really bugged me. So high up - far away from any trash services - and just so much junk on a natural "monument" - that's so sad! After reading your posts and everyone's comments, I really think I should put Into Thin Air on my reading list. Happy New Year! Yay! I can't wait to see what you think of Into Thin Air! I hope you like it. It just jumped up on the "read next" list. First of all, happy belated blog anniversary! It's been nice visiting and I will continue to drop by. I had the chance to borrow Into Thin Air but somehow it just did not appeal to me. Perhaps I should rectify that. I hope you really enjoy it! I didn't expect it to be as good as i found it to be. I really must try Harold Fry.